So happy right now. I finally managed to narrow down the reason why my AI changes didn't work. I'm still not entirely certain if I just can't use custom files for that or if I somehow implemented them wrong, but by editing the vanilla aiparam file rather than trying to use one specific to the mod, I was able to get my changes to work the way I had been trying to all day. And the difference is remarkable. Germany is WAY too strong at the moment as a result of these changes and I will need to find a few ways to stop them from succeeding in their goal to end the entire war by christmas in every game. lol. The first thing I'm going to do is take away the bonus MG I had provided everyone at the start of the game, and instead force everyone to rely on their enhanced production. This will slow everyone down while I work on better alternatives for future releases. I will be posting an update tomorrow which will include the working AI changes and retracting the MG as mentioned. Unfortunately this does mean that a vanilla file will need to be overwritten in order to play my mod, and I believe it will have an effect on any other new game you start while using that modified file so I'll try to keep that in mind with my changes. I'd encourage you to make a backup of your original AIParam file located within your INI folder in your install directory just to be safe. I'll include a copy of the vanilla file in my mod just to be safe. I will try to find a way to get it working without requiring any overwrites, but I feel the changes are simply necessary to truly see what my vision for this project is. I'm really excited about it right now. Updated OP with new version where my basic ai changes should be working. Most of it is the same as it was, except that I've changed instances where it would look for mobile units only to accept foot units, which include foot infantry, recon cavalry, and towed artillery. This will result in changes in behavior for the immediate sense, but also less of a reliance on mobile units in later games where those units become more prevalent. Only minor alterations to the types of units called otherwise. I have yet to fully test these new changes, including the removal of all the bonus MG goods, but my expectation is for some very intense fighting and a very powerful Germany. I'll work on balancing these things in future updates. Germany is extremely overpowered in this version. The fighting on the western front is all but decided by mid September with Paris falling by the end of the month and France surrendering. The French front was wiped out fairly quickly and 2 German armies advanced on her territory from the north and south. The British put up fierce resistance around Dunkerque but German numerical superiority won out before long. Need to rebalance this whole front. Things advance more slowly on the Eastern front. Germany and Austria make gains, but Russian resistance is strong, albeit late. 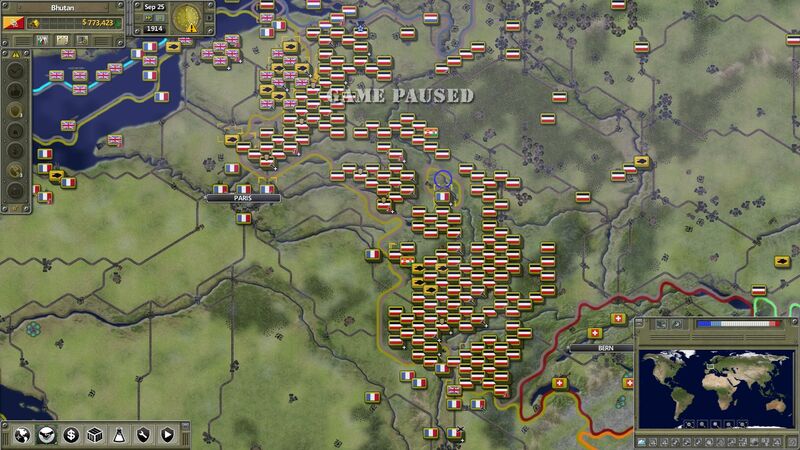 It takes too long to move their forces, so I need to get more of their forces to the front by the time fighting begins in order to blunt the initial German advances. Russia will obviously fall in my tests, but the September 26 bug puts a stop to all of the fighting so effective tests after this point are impossible atm. This will be the version I use going forward and will be balancing around. Terribly balanced at the moment, but that can be fixed. Will be removing the Italian and Ottoman alliances to the central powers in order to prevent them from sending armies into the conflict. Will begin tweaking theater/battlezone/hotspot settings to try to direct the conflict better with preliminary efforts done for the next release. Will likely reduce Germany's starting military goods to be closer to everyone else's, as they begin with a massive advantage in goods even without my events. This alone might slow down their advance and force an earlier static front. Might not be enough but will help regardless. The increase in military production otherwise appears to be doing well. Goods have been available on the market and I haven't noticed any serious lulls in fighting. Will likely look into events to try to force the French into using trenches as I haven't noticed them building any otherwise. This will help with their defense, but it'll be tough to predict where they'll need to be in order to be useful. Will also try to get the default garrisons going for the next update as that should help slow down these advances. Not a lot on their own, but it'll help the local defending armies a little put up a little stiffer resistance. Balance is definitely moving in the right direction, especially on the Eastern front. The Germans do continue to perform better than I'd like, but it's getting closer and they're suffering more for it. One issue is that military goods appear to be more abundant than I'd like, so I'm thinking of cutting production in half which is still 5x more than vanilla. I had setup several offensive hotspots in this release, and I think I want to focus on more defensive ones in this next release. Attackers have an easy time once they get through the initial defenders and only have to deal with a stream coming a few at a time after that. Getting more of them to the front sooner will slow the advance down. I think I'm also going to be taking a closer look at army compositions in the next release. Up til now, I've simply multiplied every force by 10 with no consideration for balance or composition. I'm still not going to focus very heavily on realism yet, beyond basic proportional strength to one another. I expect the German army might be decreased somewhat in comparison to everyone else. The balance of power between the German and British navies still isn't what I'd hope for, but it is also getting better. Will make additional tweaks for the next release. I'm going to look into some basic human checks for my events so that they don't trigger if it's a human player so that I don't force these changes on them. They should be able to make their own choices and have them stick. My closest game yet. Also the first time France has managed to survive right up til Sep 26th which is, as mentioned before, the point where all armies stop fighting and pretty much kills my test, but still this is good. The advantage the Central powers have is obvious, but it's getting closer. On Germany's Eastern front, they've managed to push Russia out of most of occupied Poland and have begun to make advances into the Baltic states towards Riga and Kaunus is under siege. Things look better for the Russians on the Austrian front where both sides are about evenly matched with large numbers of fresh Russian units arriving to fight the fresh Austrian troops arriving from their recent conquest in Serbia. The French and British put up sizeable resistance in France this time around, but their southern armies were particularly overwhelmed. The armies in the north, with British assistance, held out longer but reinforcements from the German's southern front eventually sealed the deal. The extent of the German advance towards Paris by the time the reserve bug kicked in which renders everything else moot. The British continue to offer resistance towards the channel but only local garrisons stand between the German armies and Paris. The British attacks in Belgium had a lot of steam going at one point and nearly managed to push as far as Brussels before the tide finally turned against them. As you can see, I'm making progress. It's still a far way off, but getting closer. A new update will possibly be out as soon as tomorrow, but more likely in 2-3 days. Looking good so far! Can't wait to play the finished mod. Me too! lol. My expectation is that I can probably have it in basic playable shape in a couple of weeks. But that's basically to get my current systems in place and working how I want them, and then expanding them to include other major combatants. I have definite plans to continue improving on it once the core mod is going though. Expanding basic systems to other countries outside of the main theaters, making it compatible with brinkmanship, adding events to help the AI build up its supply and economy to better compete with human players, improvements to AI research, including having them build additional research facilities, ect. To get all of those things working will take much much longer. But yeah, I'm aiming for 2-3 weeks for the initial playable release. Just an update that it's been a week, longer than I had planned for the next update, but it's definitely still ongoing. The heat has just sapped some of my motivation to want to sit in my room on the computer is all. It's finally cooling though so back to making progress. Wanted to give another brief update and decided to make it into something more along the way! So basically my testing continues to go very well and I feel I'm learning very quickly. Tonight I managed to track down the cause of why certain nations wouldn't deploy their armies as aggressively as other nations (or their navies at all) prior to an actual outbreak of war. It appears to be tied to forcesplan within the region data in the cvp file. Germany and a select few others had theirs set to 2, while most other nations had no entry at all. Giving everyone else an entry of 2 to match Germany results in them deploying forces in the manner I'd expect them to. I'm sure it has other functions that I'm not aware of, but I'll be taking d-bassett up on his offer and spamming him with a bunch of questions tonight to learn more. But with that part out of the way, I'm moving on to the next stage of development. The first stage was almost entirely to test and figure out how to do what I want, but now I'm beginning the actual process towards creating a genuine mod and I wanted to outline my general plan and allow everyone an opportunity to weigh in with their thoughts and general feedback. As such, I'm going to steal the concept of dev diaries so that I can keep things clear and precise without trying to cover everything all in one go. This will be the first of them, and will cover my experience with the larger army sizes and how I plan to make them work in my actual mod so that events can play out in a more historical way while also being more fun. Making the great war great again with larger armies! So I'd like to start off by saying that I generally like the larger armies and more dramatic conflict they create. This was known as the great war afterall, the most massive and intense conflict in human history up to this point in history. The tiny armies that you find in vanilla just fail to instill this feeling into the game at any point and the concept of trench warfare is impossible when you don't even have enough units to actually create a front in the first place. Having said that, I don't like how the conflict is such a 0 to 100 affair with so much of the conflict front loaded into those first few months and then losing the intensity as nearly the entire fighting forces decimate each other. 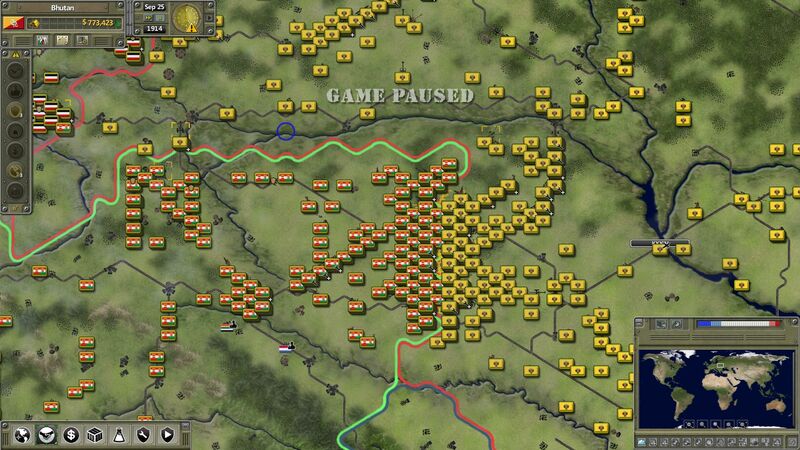 Even worse is how little I'm able to manipulate the AI to move and utilize those troops in a manner that I'd like. Theater/battlezone controls and hotspots are nice features, but just aren't enough to allow for the intensity of the war to ramp up along historical lines with the initial rapid advance of armies rushing towards the sea prior to settling into the concept of trench warfare that we're all so familiar with. Basically these larger armies just create a massive blob of forces on the border, or soon rushing to the border, for an extremely intense slugging match. Not what I'd consider ideal, at least not for what I'm after. So I believe I've come up with a solution that's somewhere in the middle. Basically, I'm going to have fewer units on the map prior to the war (still significantly more than vanilla) to represent the standing armies that each nation maintained, and then use events that place units on the map through the early months of the war to represent each nation mobilizing their forces. Each nation had different speeds at which they could mobilize their forces, and not all of their forces just magically appeared on the map ready for use at that exact point in time, and since I can't otherwise finesse how the AI chooses to deploy their forces without adversely effecting them in other ways, this just seems to be the best way to accomplish it. The fact that I'll have smaller ORBATS and fewer units needing to be placed at game starts speeding up my cache times is just a very pleasant bonus! I believe the way I'm going to do it will be to create multiple events for each combatant based loosely on where they drew their forces from. Using condition checks to make sure the country continues to own a specific hex before rewarding them with the troops from that event. So let's say you're playing Russia, and you manage to hit Germany hard enough to take East Prussia from them (A difficult task to do as Russia will mobilize much more slowly than Germany does) then it simply doesn't make sense that they'll be able to still get those troops for free dropped into their lap at Berlin for use wherever, or worse, continuing to appear in the territory you now occupy. If you lose major population centers early, then you won't continue to get your mobilized troops from those occupied populations. If you manage to fulfill your nation's historical plans to end the war by Christmas or at least making significant early gains, then you'll be making the rest of the war easier on yourself as they'll have less people they can try to mobilize to continue fighting. Ending the war early will be a priority with plenty of incentive to attack with massive offensives in an effort to accomplish it, just as it was historically. I believe this is the best way to enable historical results, without railroading them. From a historical standpoint, each side had numerous early opportunities that very well could have turned into major victories that might have potentially ended the war in their favor without having to drag on as long as it did. Just because those opportunities were squandered historically doesn't mean you'll have to suffer through a war that's forced to drag on through heavy handed means. I don't want it to be super easy though either. You might be playing a game as Germany, and you might be able to win some early victories but as you push further into enemy territory, not only will you be stretching your supply lines, but you'll be moving further away from your reinforcements as they're mobilized, and your enemies reinforcements will be growing more dense the longer it takes you to push. This will make it harder for a human player to just steamroll through the AI, but not impossible if you're crafty. At least that's the idea I plan to be building this system around. Strike hard early on to take as much as you can to weaken the enemy, and then slog it out until some kind of advantage presents itself. And the final thing I'm going to mention for this update is that I am giving strong consideration to increasing unit sizes. I haven't actually looked into what would be required to do that and then balance it with my current plans, but it's something I've very strongly considering. It's going to take a fair bit of work, and I expect that it's probably going to be about a week before I have a basic implementation in place. There's a lot more I have planned as well, from economic changes, tech changes, the potential for an earlier start date, and attempting to improve AI competitiveness in long term games by having them expand infrastructure, build supply nodes, and resource extraction where it makes sense, but all of that will be discussed later. I'll be discussing my planned economic changes both for the short term and for long term games in the next update. Obviously I'm open to any feedback, ideas, or suggestions so feel free to let me know whether you approve of my plans or think it's just a bad idea, or maybe you just have an additional idea to throw into the pot! lol. I have big plans for this mod and I really want to try to make it something that we can all enjoy. I like the idea. another thing that would help in that regard is for the allies - canada, aus, ZA, etc, to actually send in units to fight in france. I'd be suprised if any units from canada or aus actually show up. it'd be nice if they trickled in over time. 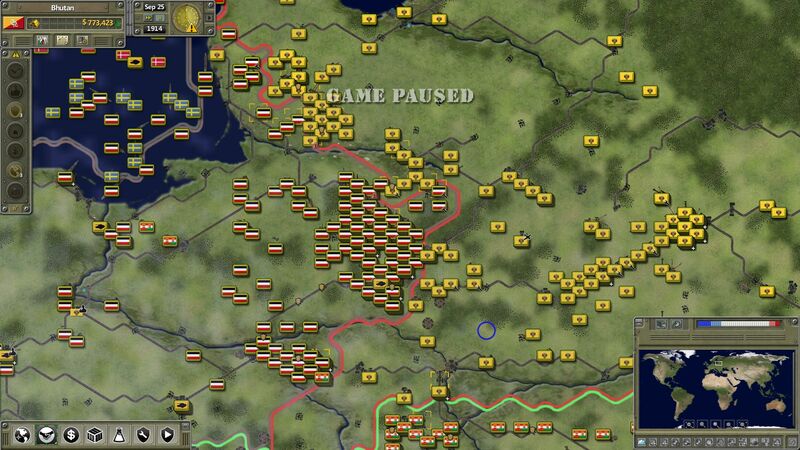 in the 1914 game im playing now, all the allies (cept Rus, France, UK) have already peace'd with germany by the end of 1914. That's a very good point that had completely been slipping my mind. I could create hotspots for those nations of course which should theoretically lead to them sending units but I could instead just have them spawn in ports in northern/western France. Could also have Indian units for some of the middle eastern campaigns. Heck, I might even give some support units such as supply or bridging units to model the Indian and Chinese personnel that assisted with logistical issues during the war. A couple of other long term plans that I had forgotten to mention before. One glaring thing missing from any WW1 game is the threat of a Russian revolution. Trying to model it in game would be pretty complicated, but I do have long term plans to implement something to model it, but it will be further in the future and I'll describe my idea more in future updates. I also have a basic idea for how I'll try to emulate the trench and fortifications that the war is known for. It definite'y won't be part of my first versions but I don't think that one will be too far off, and again, I'll be posting an update to better describe how it will work later. Just spawning units of of thin air is imo not a good mechanic. If you need manpower fast (although not with much training / firepower) then you could (dont know if possible with events) force build those "conscript" / "militia" type units or even make them faster to build. You could even try to make infantry build-able by barracks (i guess that would seriously kill the land fabrication stat) but this could reproduce your idea of mobilization of forces by cities (or not if conquered). This would also solve the unit replacement speed issue, which will be later followed by running out of reserve personnel. It's an interesting idea, but I'm not sure. From how I understand it, an infantry unit doesn't actually represent the men per se. It's really just the equipment, and when you deploy a unit, men will grab the equipment and put it to use. But they all had the weapons already, just sitting around and waiting for the men to come and grab them. Russia itself had some 4.5 million rifles by the outbreak of war, but a standing army of only about 1.4 million men and another 5 million that they mobilized during 1914. The problem is, I can't give the AI the equipment because they'll immediately try to use them, and it doesn't make sense to me that they'd have to produce it. The interesting thing about WW1 was that they had highly convoluted processes for mobilization which took a considerable amount of time for everyone, but the more centralized and industrialized nations were able to refine their process to bring men up faster than countries such as Russia. In fact, these mobilization times played prominently in each powers war planning, and was a major consideration for Germany deciding to try to smash France first as Russia was expected to take a very long time to be able to present a credible force that could threaten them in the East. It's these 2 points that I'm basically looking at. I don't really want to just spawn units out of thin air really, but I also don't want to force countries to build equipment they already had available to them. I also don't want unit construction to be too extreme. 1914 saw the largest increase in soldiers, again because all of the participants mobilized. Russian troops, both the standing army and their mobilized forces in 1914 was about 6 million, with only 12 million total for the entire war. That's pretty much half of their total mobilized forces being done in just the first 6 months of the war. If I try to change the way unit construction occurs, then nations either won't be able to produce enough forces within the first 6 months, or they'll be able to continue producing far more troops than I'd want them to for much too long. It would continue to be an issue in the interwar years as well, which I don't want either. I really do appreciate the feedback, and will try to consider that as I go but I simply think the events are the only way to emulate the war in any reasonable way. 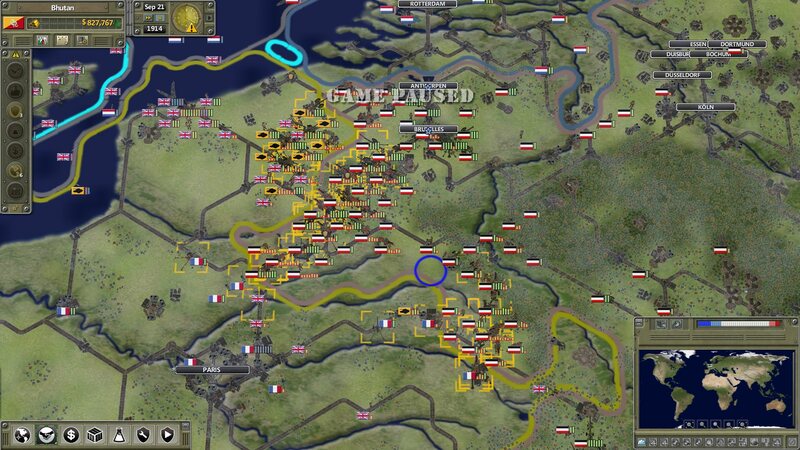 I want the large armies, but I want it slightly more spaced out than it is when I just put all the units on the map from the beginning, and I'd like to be able to develop my mod with the interwar years and the buildup to WW2 in mind which really means I can't go making changes that'll effect things beyond the war. I don't mind adding all of these extra units, because most of them will be killed off and I'm going to be using events which should result in nations trying to scrap their excess units, so I'm not terribly worried about them creating performance issues. So yeah. If you can think of any other alternatives to let me get what I want out of it then I'll definitely consider them. I'm just not sure there's another way with the way things currently work. Wanted to post an update here as it's been a short while, and definitely longer than I originally planned. Without getting too drawn into the details, some house renovation work has proven to be taking up more time and energy than I originally had anticipated especially considering the heat we've been dealing with in Cali. The project is definitely still alive and ongoing though. I've been putting a lot of time into researching army compositions, mobilization plans and timelines, in addition to quite a bit of other interesting details to help me in deciding exactly how to do this. I've also been looking up unit personnel numbers and doing some basic math to get the unit compositions for the combatant armies that I'm aiming for and I'm currently pretty happy with what I have so far. I'm going to be working on implementing this into the relevant ORBATS tonight and one step closer to a release of the real, not just for testing, version of the mod. @ way2co0l, is this project still active or did the remodeling and the heat kill it?